Home General King Kong Invades Great Neck South! 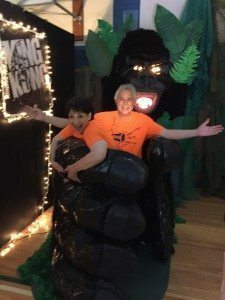 King Kong Invades Great Neck South! Some of the Hollywood figures, except for Marvin Anchin. He’s wearing an orange shirt! 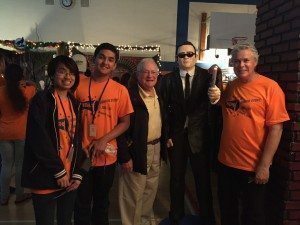 Joe Friedman, Marvin’s close friend and assistant, stands in the middle. That’s their Tommy Lee Jones creation to Joe’s left and Marvin’s right. Paper mache master Marvin Anchin’s latest sculptures were a hit at the annual Great Neck South High School Senior event. 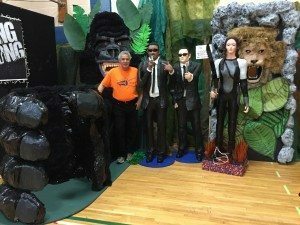 Anchin, the Great Neck resident who’s been creating figures based on a theme for many years, decided on “movies” this year. Among those he saluted were Will Smith and Tommy Lee Jones (Men in Black), Jennifer Lawrence (Hunger Games) and, of course, King Kong. Kong was a particular hit as students and parents lined up to have their picture taken with the big guy. Marvin and his wife, Tina, “trapped” in the grasp of Kong. Marvin Anchin is an amazing artist who year after year shares his talent with generosity and joyous spirit. The district and the children are lucky to have him.